La Colombina borders on both the Ciacci and Uccelliera estates in the township of Castelnuovo dell'Abate. The vineyards have been in the Caselli family for generations, but the family, proprietors of a winemaking-equipment shop in Montalcino, had always chosen to sell the grapes rather than bottle their own wines. Husband and wife team Anna Maria and Alamiro decided to make the leap into wine production in the mid-90s, and were lucky to have 1997 as the first vintage of this estate-bottled Brunello! The superior location of the estate is immediately evident in the ripe, powerful fruit on the nose, with an underlying intensity and weight that is typical of Castelnuovo dell'Abate, making wines that, similar to Ciacci and Uccelliera, are compelling and long-lived. 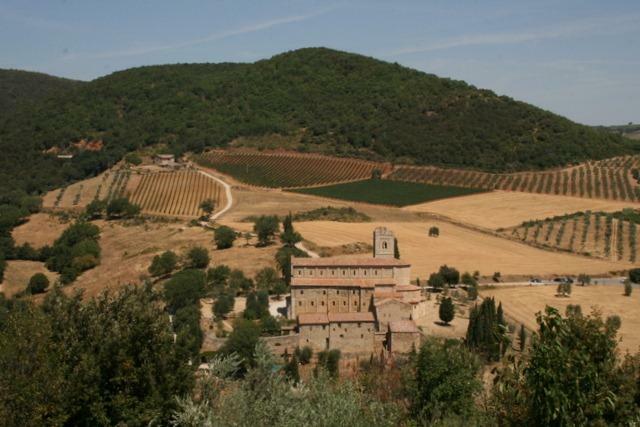 Close in quality to their better-known neighbors, Colombina's wines remain a great value, particularly their Rosso di Montalcino, which delivers great Montalcino Sangiovese at a fraction of the cost of other rossos. Wine Spectator 94 "This red combines power and elegance, with bright acidity and dense tannins. Cherry and plum fruit are accented by leather, tobacco and mineral as this glides to a lingering conclusion. Shows fine balance, with a tealike finish. Best from 2020 through 2035. 1,200 cases made. –BS"
Vinous Media 91 "Dark cherry, plum, licorice, tobacco, cedar and menthol all flesh out in La Colombina's 2013 Rosso di Montalcino. Supple and inviting, the 2013 is an excellent choice for drinking over the next few years, while the fruit retains its characteristic radiance. -- Antonio Galloni"